Barceloneta - a fishing district which was originally built to house those who lost their homes when the old La Ribera district of Barcelona disappeared. Begun in 1753 by Próspero Vervoon with one story houses. However, in 1837, the barón de Meer authorised the addition of another storey to each building and the area became the first "eixample" (expansion) of Barcelona. Blocks of flats were constructed, 100m x 100m in straight streets and the beaches were cleared. 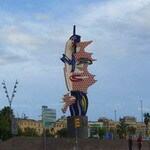 Barceloneta is within easy walking distance of Las Ramblas and the Gothic Area of Barcelona. The magical world of Casa Battló - designed by Antoni Gaudí for the Battló family. 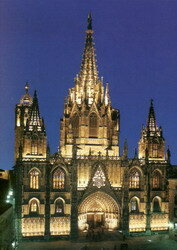 More than a building, it is a legend of art and the masterpiece of Antoni Gaudí. The Modernist facade represents the waves of a calm sea - the roof tiles look like fanciful scales. The attics and chimneys never fail to delight and fascinate. As Gaudí was known to say ".. the only straight line is the horizon..."
Originally the architect was asked by the textile magnate Josep Batlló to demolish a nondescript building designed in the 1870s by Emilio Sala Cortés and create a new house. But Gaudí convinced Batlló that he could keep the existing structural framework and remodel it into a masterpiece that would both shock and delight fin de siècle Barcelona. 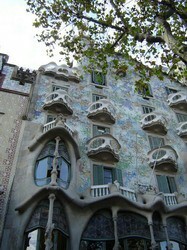 Casa Batlló is situated on the Paseo de Gracia in L'Eixample, one of Barcelona's most exclusive neighborhoods. Also on this so-called "block of discord" are the houses of other prominent industrialist families such as the Amattlers and the Lleós. At the turn of the century these families were engaged in a battle to "keep up with the Joneses." If one house featured tile, the next house would incorporate more elaborate tile. If one family hired a particular architect, the next family to build would hire a more prominent one. 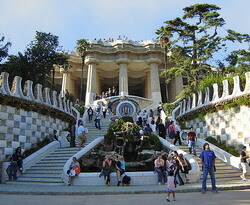 Gaudí was the last architect in this competitive sequence to build in the notorious block of discord. By the time he arrived, the stakes were high, and he needed to produce something spectacular. 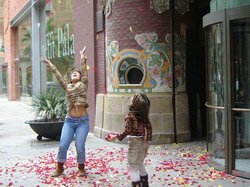 His success is evident; the Batlló house represents a creative tour de force. It is one of Gaudí's last private commissions before he grew more reclusive and dedicated his energies to the Sagrada Familia. Tel: 93 216 03 06 PRICE OF VISIT: 16 Euro including rooftop and attics. "Casa Milà - La Pedrera" (1906-1912). In the late 19th and early 20th century the district of Eixample (Passeig de Gràcia and the surrounding areas) became the hub of Barcelona's expansion. Antoni Gaudí was commissioned by the industrialist, Pere Milà, to construct a building on the boundary of Barcelona and Gràcia, as both a family residence and also to be leased as separate dwellings. Owing to the way its facade appears to be carved out of rock, the Casa Milà was nicknamed "La Pedrera", which means stone quarry. In 1984, UNESCO declared it a World Heritage Site." 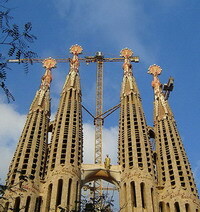 It is interesting to note that there is an excellent view of Sagrada Familia from the roof! Monday to Sunday, from 10h00 to 20h00 (last admission at 19h30). Closed: 25th and 26th December, 1st and 6th January, and one week in January (check out dates). Miró's works are to be found today in the world's principal museums and cultural institutions. 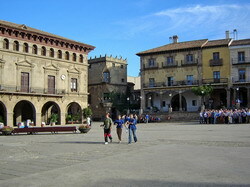 Many, however, have remained in Catalonia, mostly in the Joan Miró Foundation in Barcelona. Here are a few of his sculptures - the gallery is well worth visiting for the numerous pieces of art and sculpture in the permanent collection, information about the artist, plus the exhibitions. Unfortunately you are not allowed to take photos of the paintings, so you will find a few of Miro's sculptures in the slide show. Despite being such a large and busy city, Barcelona has many quiet and green corners for you to rest and recover from your sight-seeing. 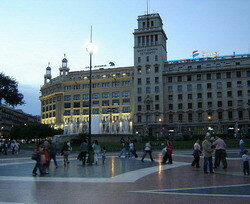 Here is a small selection of what is available including the famous Plaza Catalunya. Plaza Catalunya (or Plaça Catalunya as it is also known in Catalan) is an important centre in the city - situated between L'Eixample and Las Ramblas, right down to the Port of Barcelona. Conveniently placed for the tourist buses and taxis. Visit the plaza in the evening to view the fountains. 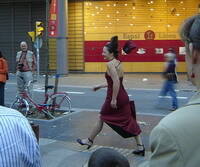 Las Ramblas - vibrant walking area of Barcelona with its cafes, restaurants and shops. Stroll from Plaza Catalunya right down to the Port, enjoying the antics of the street artistes and human statues on the way. 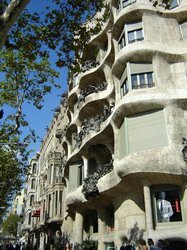 Visit Casa Battló (Gaudí's masterpiece) and La Pedrera (Casa Milá) not too far a walk away and the Gothic Quarter within easy walk/bus trip. 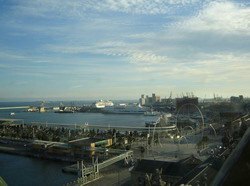 Stroll down to Barceloneta, Port Vell and the beach. Unfortunately photos are not allowed inside the Palau de la Musica. I managed to get one interior photo and a few outside photos on a rather cloudy day... also including a couple of street scenes close by.